If students develop the skill of researching on the Internet at a young age, this will stand them in good stead for life in the future. There are eight worksheets in this resource and an answer key. Each page has suggested details of what should be written in the search bar to help with finding the information required to complete the four questions and find the appropriate flag for each country. 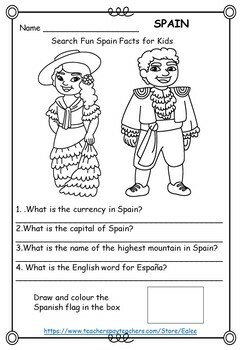 In order to answer the questions, students have to read about the country and select the answers from the provided information. 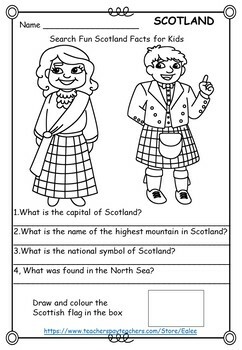 A front cover is also included for use if the resource is being made up as a booklet. 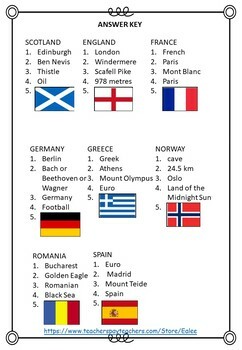 The countries included are England, France, Germany, Greece, Norway, Romania, Scotland and Spain. All worksheets are available for viewing in the preview. This resource could be used by the whole class , pair work, group work or for students who finish their work early and need an additional purposeful task. The information gained by the students through research will help to increase their general knowledge about some European countries. How to get TPT credit to use on future purchases in any store. Please go to your 'My Purchases' page (you may need to login again). Beside each purchase you'll see a Provide Feedback button which you should click. This will take you to a page where you can give a rating and leave a short comment about the product. TpT will automatically give you credit to put towards a future purchase in any TpT store. Your feedback is very important to me because it lets me see which products are most useful. Any purchased product can be downloaded unlimited times. If you have just arrived at this one product and are not already in the EALEE store but would like to visit the store to see other products, just click on the word EALEE at the right hand side above the follow star. This will take you to the EALEE store where there are many other resources, some are free for you to download. If you would like to hear about new EALEE products, don't forget to click the green "follow me" star at the top of this page. Thank you for looking. Feedback is always appreciated.